I got a full set from my local toy shop! If you want to know anything about the figs, I'll be happy to answer! wait so is series 1 still showing up state side? I am so mad that I have yet to see one bag... not one. It would be great if these guys started magically showing up. Sorry if this is been said before, but in TRU, where have they been putting the boxes or individual bags? However, on the plus side (for some) it would seem to appear that Series 2 is being released to the US earlier this time, as i understand from another forum that some people in the US are beginning to find series 2 boxes. I hope this is a case of increased production numbers and not just Lego oiling the squeeky wheel. I saw Series 1 once and never again at a Fred Meyer. There, they had two boxes and I was able to get exactly what I wanted. This was three weeks ago. My closest Toys R Us never received any. As an aside from the distribution talk (in a way), I was in Toymaster the other day (British toy retailer), and they'd just got two new boxes of series 1 in. The cashier was kind enough to provide a list that basically told me which each figure was - no barcodes, she'd written a number for each figure on the back of the packet - and, while looking through for a clown/robot/etc, one of the other employees offered two tidbits of information: series 2 was 'coming very soon', but, in something a little more newsworthy, he mentioned he had 'barcodes' for series 3. He refused to show me, but said one of the figures was 'similar to Harry Potter'. My first thought was 'series 3 doesn't have barcodes', and the 'Harry Potter' character could easily have been the witch from series 2, but he seemed to know what he was talking about - he knew everything that was in series 2 already, and we discussed the best of series 1, so he could easily have been telling the truth. But, alas, he may have simply been confused. Nonetheless, for those in the UK, series 2 will indeed be coming very soon, and series 3 may well still use the barcode method... now we play the waiting game. I was in Florida this last week with my family, and decided to go to the LEGO store at Downtown Disney, hoping to pick up some minifigs, since there is not a single place to buy them here in Wisconsin. When I asked the clerk, she said that they were sold out, and the Series 1 line was discontinued. Anyone else have any other info? Series 1 has come and gone. If any more cases turn up (and it is highly unlikely) they got stuck in someone's distribution system. 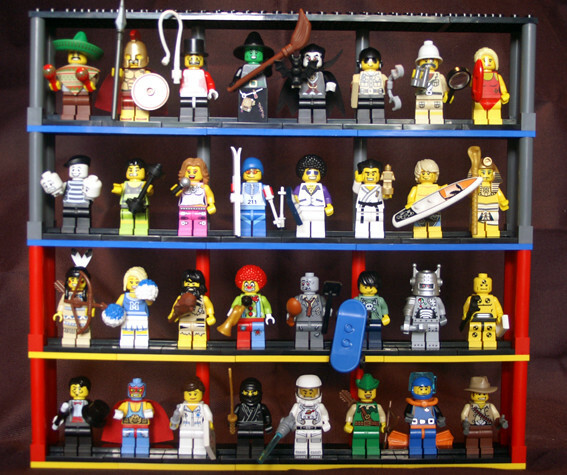 At the moment, Lego has not revealed plans to produce any more of Series 1. Hence, they are for all intents and purposes "discontinued." But that's only Series 1. Series 2 should be turning up any day now. If Series 2 follows the same pattern as Series 1, they will first appear in Lego Stores, followed by Toys-R-Us, Borders Bookstores (who, according to their computers, have jacked their prices up to $3.99 per figure,) and variety of other stores as mentioned throughout this forum. In my area the distribution was TRU first and my Lego store followed about 2 weeks later and then eventually Borders. I can't help feeling like we're all part of that classic movie "It's a mad mad mad mad world". that guy wrote: In my area the distribution was TRU first and my Lego store followed about 2 weeks later and then eventually Borders. I can't help feeling like we're all part of that classic movie "It's a mad mad mad mad world". Other than Borders, which I never checked, that mimics my experience in the Charlotte NC area. Both times at TRU that I saw them I was the only person looking for them. The brand store was indeed a crazy scene, people running around with armloads and looking crushed when the aprons told them about the limit of five. When I picked up my zombie & gave my barcode sheet to this lady I thought she was going to kiss me. From the last time w/ series 1, the first time I saw a box at a TRU it was completely picked over and I can see it was the same ones left over so I decided not to buy any and a week later when I decided I wasn't going to find any elsewhere I went back and of course it was all gone. Too bad Lego didn't go a better job of putting these back into production so that they didn't have to limit people to 5 figs a person...their production cycle must be really lengthy or they just want to build up demand for future series...which sounds like they did a pretty job of. They are apparently only allowing full boxes and cases (two boxes per case) for their EE Distribution customers (of which I am one). That no longer seems to be the case. I just ordered a box and I'm your average Joe-Shmo customer. MicroJow wrote: That no longer seems to be the case. I just ordered a box and I'm your average Joe-Shmo customer. Thank you. I ordered a box also. Shipping was steep but with no sales tax and remembering how much gas I used hunting down series 1 this is a great deal. This coupon expires August 10, 2010. At 37% mark-up? I think I'm going to pass on the EE offer this time, and maybe just stop caring about these figs altogether. They're nice designs, but I can't be bothered to "chase" them, especially if they're going to be marked up and made with sub-par standards when compared to figs in sets. Lego apparently bumped the retail from $1.99 to $2.49, so that's really only $15 extra per case. Considering you could easily sell some on eBay/BL, it still might be easier than driving all over town hunting for them. I guess we'll just have to wait and see how everyone prices Series 2 but I'd be surprised if the Lego Stores sell 'em for more than $1.99 apiece. As mentioned earlier, I saw in the Border's computer that they're jacking the price up to $3.99 each. I wonder if people are going to buy them at that price! Shouldn't we be getting an indication of Lego.com pricing soon based on overseas sales beginning? I know the ones so far on Ebay that being "pre-sold" aren't showing any massive increase over series 1 but I guess you never know. I do know that several companies like BigBadToyStore.com and Puzzlezoo have raised prices so far. As for EE, they're not THAT bad but the shipping is where you really get hosed. I mean really, does it cost $40 to ship a 3 lb box several states away? I think not. Plus there is a strong indication that they (EE) and other wholesale/retail combo sites are cutting back the offering to wholesale clients and pushing more to their retail side, but would we really expect any less?? If that holds true, I think I'm even less interested in trying to acquire these. Great idea (long overdue, in fact) but poor execution. The only thing that could justify a price increase for a wave that was already planned and produced is the opportunity to maximize profit. It's a business so I get the desire to do that, but at this point, it just seems like an attempt to gouge the consumer for what is ultimately an inferior product anyway. Nuts to this.